Outbound iCal feeds from your Teamup calendar let others view your schedule on their calendar app of choice. An iCalendar feed, often also called ics feed, is a standard calendar format used by many popular calendar services. It allows you to share calendar data between different calendars and calendar services. For example, you can display your Teamup Calendar events in Apple iCal, Google Calendar, Outlook or any other calendar application that supports iCalendar feeds. You can set up inbound and outbound iCalendar feeds. 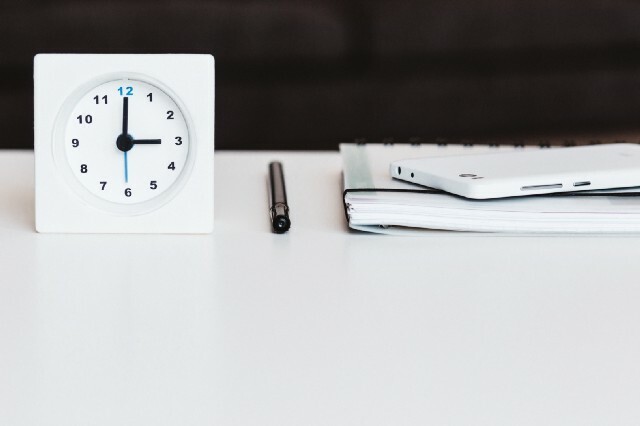 In this post, we’ll talk about outbound iCalendar feeds: displaying your Teamup calendar feed on another calendar service (which could be owned by you or someone else). Teamup uses unique calendar keys to grant calendar access via customized links. It’s a streamlined and simple way to use a calendar, with no login needed. Your outbound iCalendar feed is generated from the link you use to access your calendar. This is a very important point, because it means that the feed URL contains the unique calendar key you’re using when you create the feed. However, if you’re using an administrator link when you get your iCal feed, the feed URL will contain the administrator key. That’s a big security issue; anyone with the administrator calendar key can open your calendar as the administrator and have complete control of it. To maintain the security of your calendar, never share iCal feeds from your administrator link, or another link meant for use by another user. Instead, everyone should get the iCalendar feed URL from the link he or she is granted access with the appropriate permissions. An administrator can also create a special link with read-only permission to selected sub-calendars and use that link to get an outbound iCalendar feed URL. Teamup refreshes the feed source immediately after each change. However, the update frequency a user experiences varies depending on the subscribing calendar program. What date ranges are shared in an iCal feed? iCalendar feeds include event data between 6 months in the past and 12 months in the future. Read more about what you need to know about Teamup iCalendar feeds. Create a calendar link that allows access to the sub-calendar(s) you want to include, and set appropriate permissions for each one. Then open your calendar using that link. Now, copy the iCalendar feed URL and you’re ready to share it. Copy the iCal feed URL from a sharing link with appropriate permissions. Here’s a more detailed, step-by-step look at how to find and share a secure, outbound iCalendar feed from your Teamup calendar. Step 1. Create a calendar link. Go to Settings > Sharing, then click on the +New Link button in the top right. Click on the blue button to create a new calendar link. Step 2. Choose the calendars to include. You can include all calendars or only selected sub-calendars. For the sub-calendar you include, you’ll be able to get a unique iCal feed URL for each one individually. Step 3. Set the permissions to read-only. Set the permissions for the iCal feed. If you’re including selected calendars, set the permission to Read-only for each one. If you want to share a calendar feed that shows scheduled events as reserved time blocks, without any event details, set the permission to Read-only, no details. Step 4. Open your calendar using the new link. Save your new calendar link, then copy and paste it into your browser or click Open. Click on Open to access your calendar in a new window via your read-only link. Step 5. Get the iCalendar feed URL. To get the iCal feed uRL, click on the menu button in the top right corner of your calendar. Then select iCalendar Feeds. Note that the calendar link you’re using is displayed in the top bar. You’ll see a list of the sub-calendars you included in this link, with an individual iCalendar feed URL for each one. You’ll have one unique iCalendar feed URL for each sub-calendar. Copy the feed URL for the calendar you want to share, and you’re set. All you have to do is provide to the person who will be using it, or paste it into your other calendar application. iCalendar feeds are one-way. They can be used to view calendar data but not to modify calendar data. The data is provided via a one-way synchronization from Teamup Calendar to another calendar system. Your iCalendar feed includes the calendar key of the link you use to access your calendar. Always use a link with appropriate permissions to get an iCalendar feed URL. If you get the feed URL while accessing the calendar via your administrator link, your full administrator key will become part of the iCal feed URL. If you share this feed URL with others, someone could simply copy and paste the administrator key from the feed URL, then access your calendar with administrator permissions and even delete your entire calendar. Never use your administrator link to get an iCalendar feed. If a calendar link is deleted, all iCalendar feed URLs associated with that calendar link will stop working. However, data shared in the past cannot be taken back. Users of password-protected calendars links can subscribe to the feeds the same way as from non-password protected calendar link. The password is encoded securely into the feed URL. If the password of a calendar link changes, the associated iCalendar feed URLs will stop working. 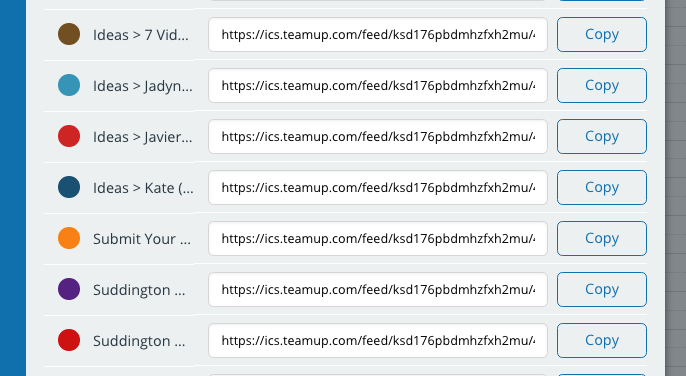 The iCalendar feed URLs you create and share are always under your control. If you need to revoke access to an iCalendar feed, it’s easy to do so. 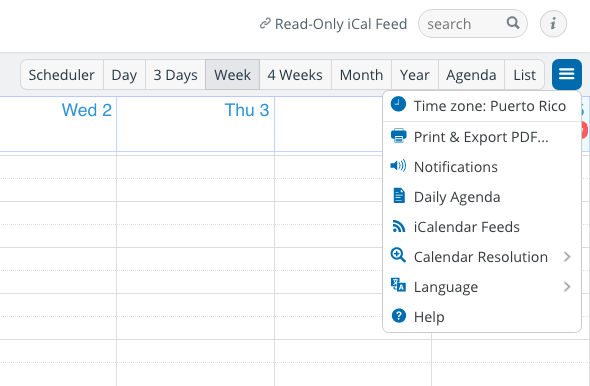 You can manage iCalendar feeds globally in Settings > General Settings, with a toggle that enables or disables all iCalendar feeds for all users of the calendar. You can delete the calendar link from which you generated the iCalendar feed URL. Or, for a password-protected link, you can simply change the password for the associated calendar link. The old link — which contains the old password embedded in it — will no longer work. You can read more about inbound iCalendar feeds, or learn how to consolidate multiple calendar feeds into one view. How could you use iCalendar feeds to simplify your life and create more efficiency? We always love to hear how Teamup is working for you. Share your story! Header image by freestocks.org on Unsplash.